Georgia’s oldest city is known for its beautiful natural scenery, cobblestone streets, quaint country squares and centuries of history. Spring is an ideal time to visit this southern gem and if you’re planning your Savannah vacation during this time, there are many things to do and see. Read on for the best things to do in spring in Savannah. Located in the Victorian District of Savannah, Forsyth Park is a must visit during any season, but especially during the mild months of spring. The 30-acre park is a gathering place, bustling with activity throughout the year. From concerts and recreational sports to a variety of events, there is always something happening. Be sure to see the famous Forsyth Park Fountain, which sits at the north end of the park and was built in the mid 1800s. Lovely benches surround the fountain and make for a great spot to sit and people watch. Check out the Confederate Monument, a large bronze sculpture that has been in the park since 1879. It is a lasting tribute to all of the men who fought in the Confederate Army during the Civil War. Take advantage of the park’s picturesque scenery for great vacation photos. 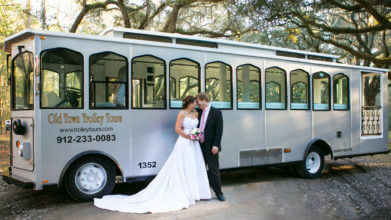 Only Old Town Trolley Tours can offer you the most comprehensive Savannah sightseeing experience. This fully narrated tour takes you to more than 100 different points of interest in the city and shares the fascinating stories of the people and places in Savannah’s history. The orange and green trolley will make stops at the Telfair Museum of Art, the Jepson Center for the Arts, River Street, the Sorrel-Weed House, the Juliette Gordon Low Birthplace, Colonial Park Cemetery and much more. You’ll have the opportunity to get off and back on as often as you wish throughout the tour and spend as much time as you’d like at any of the stops. Dig into real southern cooking at Mrs. Wilkes Boarding House, do some shopping on Broughton and view the Victorian houses at your leisure. There are trolleys coming and going all day long. Located just south of the city on the banks of the Ogeechee River, this historic park showcases the best-preserved earthwork fortification of the Confederacy. Here you can see cannons, a furnace, barracks, palisades and a Civil War Museum displaying artifacts from the Civil War era. The park offers various programs and tours throughout the year including Civil War infantry and weapons demonstrations. Fort McAllister is also a place of great natural beauty, with giant live oaks, Spanish moss and salt marsh. Those who love the outdoors can enjoy camping, fishing, boating, kayaking and a quiet picnic on a warm spring day. This historic cemetery’s magnificent beauty has beckoned writers, artists, poets, photographers and filmmakers for more than 150 years. It became famous when it was featured in the 1994 novel Midnight in the Garden of Good and Evil by John Berendt. A visit here is one that will treat you to extraordinary natural beauty and the opportunity to see the final resting place of many prominent and well-known Georgians. Among the buried here are award-winning singer and songwriter Johnny Mercer and Georgia’s first governor Edward Telfair. There are several monuments and areas designated for different groups of people including the American Legion Field, the Order of Railroad Conductors site, the Holocaust Memorial and the veterans of the Spanish American War of 1898. When you visit, stop in at the Visitors Center for their special guide to the cemetery, which will help you find all the important spots on the property. Situated in the heart of the city, Riverwalk in Savannah is one of the area’s mostpopular attractions for visitors and locals alike. Cobblestone streets lead to exceptional dining experiences, unique shops and a variety of entertainment. Be sure to check out Factors Walk and the Cotton Exchange as well as the many other historic buildings in the area. Of course, take some time to gaze out at the river – a gorgeous sight at any time of the year. Savannah’s St. Patrick’s Day Celebration is one of the most popular and well-known festivals in the region. The celebration grows in size each year, with approximately 350 floats and marching units participating in the parade. River Street also hosts the Celebration on the River, featuring live music, food vendors and cold beverages. Be sure to wear green and sample some of Savannah’s famous green beer and emerald-colored grits while you’re enjoying the festivities. Take the annual Spring Tour of Homes in Savannah to get a special behind-the-scenes look at some of the city’s ornate private homes. Savannah has one of the largest historic districts in the United States with 22 squares surrounded by beautiful homes, gardens and churches. Home and garden tours are self-guided with different neighborhoods featured each day, so you’ll be able to see a variety of unforgettable homes up close. The Savannah Music Festival is the largest musical arts event in Georgia. The festival celebrates many different genres of music, from folk to classical to jazz and more. A record number of tourists and locals gather at the festival to enjoy world-class music and learn more about Savannah’s rich heritage.